President Trump attends convention of the International Association of Chiefs of Police in Orlando. President Donald Trump said Monday he has no plans to fire Deputy Attorney General Rod Rosenstein, delivering a reprieve for the Justice Department official whose future has been the source of intense speculation for two weeks. Trump told reporters at the White House that he had "a very good relationship" with Rosenstein and was eager to speak with him aboard Air Force One on a flight to Florida for the International Association of Chiefs of Police conference. They did talk, for about 45 minutes, but not alone, a White House spokesman said. The group discussed violent crime in Chicago, support for local law enforcement, border security, the police chiefs' conference they were flying to and "general DOJ business," spokesman Hogan Gidley said without elaboration. "The press wants to know, 'What did you talk about?'" 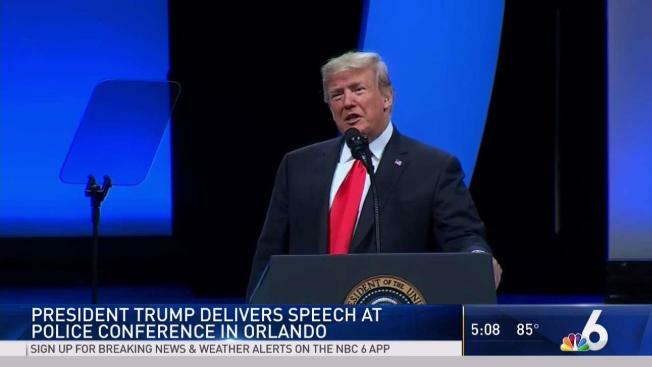 Trump said later to an audience of police officials. "But we had a very good talk, I will say." The flight provided an opportunity for their most extensive conversation since news reports last month that Rosenstein had discussed the possibilities in early 2017 of secretly recording Trump to expose chaos in the White House and invoking constitutional provisions to get him removed from office. Those reports triggered an avalanche of speculation about the future of Rosenstein — and also the special counsel's investigation into possible coordination between Russia and the Trump campaign since the deputy attorney general appointed former FBI Director Robert Mueller to his post and closely oversees his work. 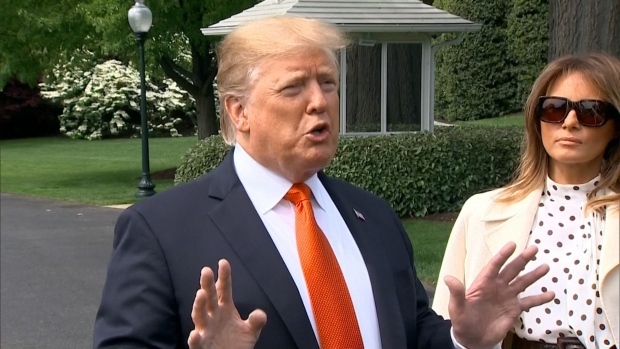 "I didn't know Rod before, but I've gotten to know him," Trump said at the White House. "I look forward to flying with him. It'll be very nice." If Rosenstein Leaves Justice Department, What Happens Next? The Justice Department has denied that Rosenstein had proposed invoking the 25th Amendment of the Constitution and issued a statement that said the remark about recording the president was meant sarcastically. Even so, Rosenstein told White House officials that he was willing to resign and arrived at the White House at one point with the expectation that he would be fired. He met in person with White House chief of staff John Kelly and spoke by phone with Trump during a tumultuous day that ended with him still in his job. Trump had previously said that he would prefer not to fire the Justice Department's No. 2 official and that Rosenstein has told him he did not say the remarks attributed to him. Advisers had also cautioned Trump against doing anything dramatic in the weeks before the midterm elections next month. Kelly was present for Monday's conversation between Rosenstein and Trump, the White House said, as was Rosenstein's top deputy at the Justice Department, Ed O'Callaghan. The speculation over Rosenstein's future concerned Democrats, who feared that a dismissal could lead to Trump curtailing Mueller's probe. Although Trump has at times criticized his deputy attorney general, he has reserved his sharpest verbal attacks for Attorney General Jeff Sessions, who recused himself from the Russia investigation in March 2017 because of his own earlier involvement with the Trump campaign.